The Oscar nominations came out this morning and as expected, the late Heath Ledger got a posthumous best supporting actor nomination for his brilliant performance as the Joker in The Dark Knight. 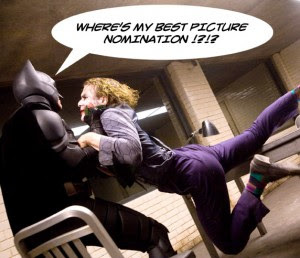 Unfortunately, Dark Knight was denied the Best Picture and Best Director nominations that geeks were hoping for (Seriously…The Reader was a better movie than The Dark Knight?!?!?). Anyway, I guess we should be happy that overall Bats got 8 nominations in all. Not bad for a “comic book movie” as movie snobs like to degrade it to. Also, Wall-E, another best pic hopefull only got a best animated pic nom. I guess the vindication here is that Andrew Stanton got a best screenplay nom for the film.